(2013) "Progressive Museum Education: Examples from the 1960s," International Journal of Progressive Education, 9 p. 61-76. The entire issue is available as a PDF here. G. E. Hein “Múzeumpedagógia: Nézzünk elöre!” in Vásárhelyi, T. és Kárpáti A. , A Múzeumi Tanulás Kézikönyve: Továbbképzı tanfolyami jegyzet, Budapest: Magyar Természettudományi Múzeum, 2009. G. E. Hein, (2006) “Progressive education and museum education: Anna Billings Gallup and Louise Connolly”, J. Museum Education, 31 161-174, 2006. G. E. Hein, “The Meaning of Meaning Making,” Exhibitionist, 25 , 18-25, 2006. Original Philosophy’ and its Significance for Museums,” Curator, 49 , 181-202, 2006. G. E. Hein, “Museum Education,” in S. MacDonald, editor, A Companion to Museum Studies, Oxford: Blackwell Publishing, 2006. G. E. Hein, “The Role of Museums in Society: Education and Social Action," Curator, 48 , 357-363, 2005. G. E. Hein, “John Dewey and Museum Education,” Curator: The Museum Journal, 47  413-427 (2004). G. E. Hein, “Museum-School Bridges: A Legacy of Progressive Education,” ASTC Dimensions, Jan/Feb 2004, 6-7. M. Black and G. E. Hein, “You’re Taking Us Where? Reaction and Response to a Guided Art Museum Fieldtrip,” in M. Xanthoudaki, L. Tickle & V. Sekules (eds.) Researching Visual Arts Education in Museums and Galleries, Dordrecht: Kluwer Publishers, 2003. D. Bartels and G. E. Hein, “Learning in Settings Other Than Schools,” book review, Educational Researcher, Vol. 32 38-42 (2003). E. B. Bailey and G. E. Hein, “Museum Educators and Communities of Practice,” ASTC Dimensions, Nov./Dec. 2002. G. E. Hein, “Learning in Museums, A Continuing Conversation,” The Informal Learning Review, No. 55, Nov./Dec., 2002, p. 9-11. 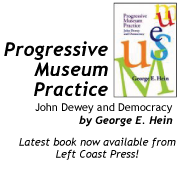 E. Bailey and G. E. Hein, “Museums and the Standards: Perspectives on How Museums in the United States Are Being Affected by the national Education Reform Movement,” in Dufresne-Tassé, C. editor, Evaluation: Multi-Purpose Applied Research, Montreal: ICOM/CECA, 2002, pp. 85-96. G. E. Hein, “Constructivism: More than Meaning Making,” Museological Review, 7, 1-17 2001. L. Baum, G. E. Hein and M. Solvay, “In Their Own Words: Voices of Teens in Museums,” J. Museum Ed., 25 9-13, 2000. G. E. Hein, “Is Meaning Making Constructivism? Is Constructivism Meaning Making?” The Exhibitionist, 18(2) 15-18, 1999. E. Bailey, K. Bronnenkant, J. Kelley and G. E. Hein, “Visitor Behavior at a Constructivist Exhibition: Evaluating Investigate! at Boston’s Museum of Science,” in Dufresne-Tassé, C. editor, Évaluation et éducation muséal: nouvelles tendances, Montreal: ICOM/CECA, 1998, pp. 149-168. G. E. Hein, “What Can Museum Educators Learn from Constructivist Theory?” Gesché, N. (ed.) Study Series, Committee for Education and Cultural Action (CECA). Paris: ICOM: 13-15, 1996. G. E. Hein, “The Constructivist Museum.” Journal of Education in Museums, 16, 15-17 1995. G. E. Hein, “Evaluating Teaching and Learning in Museums,” in Eilean Hooper-Greenhill, editor, Museums, Media, Message, London: Routledge, 1995. G. E. Hein, “Museum Education, A Bibliographical Essay,” Choice, Vol. 30, July/August, 1993, pp. 1733-1741. G. E. Hein, “The Significance of Constructivism for Museum Education”, in The Museum and the Needs of People, Haifa: Israel, National ICOM Committee, 1992 (reprinted several times, and translated into Spanish and German). G. E. Hein, “How Children Behave in Museums,” I.C.O.M. Education, XII and XIII, 52-57, 1991. G. E. Hein, “Teaching Teachers to Use Museums,” in Establishing, Maintaining and Developing Museum Educational Services, Athens: I.C.O.M. Hellenic National Comittee, 1991. B. Davidson, C. L. Heald and G. E. Hein, “Increased Exhibit Accessibility Through Multisensory Interaction,” Curator, 34/4, 273-290, 1991. S. Price and G. E. Hein, “More than a field trip: science programmes for elementary school groups at museums,” Int. J. Sci. Educ., 13, (5) 505-519, 1991. G. E. Hein, guest editor, “Learning from Others about Learning,” special issue of the Journal of Museum Education, 15 #1, Winter, 1990. G. E. Hein, “Learning about Learning in Museums,” Hand to Hand, Association of Youth Museums, Winter, 1989. G. E. Hein, “Evaluating of Museum Programs and Exhibits,” in T. H. Hansen, K.-E.Andersen and P.Vestergaard, editors, Museum Education, Copenhagen: Danish I.C.O.M./CECA,1982. B. S. Engel and G. E. Hein, “Qualitative Evaluation of Cultural Institution/School Education Programs,” in S. N. Lehman and K. Igoe, editors, Museum School Partnerships: Plans and Programs, Washington, DC: Center for Museum Education, 1981.